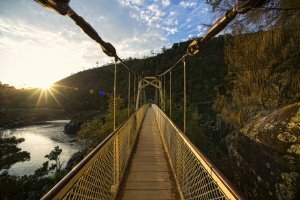 Our Cataract Gorge Launceston walking tour is a self guided nature walk close to the centre of Launceston City. 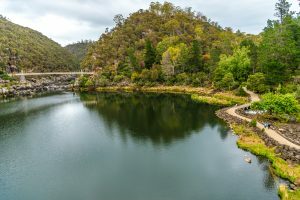 Launceston is a wonderful city to explore on foot, and within easy walking distance of the downtown Launceston area and Brisbane Street Mall is Cataract Gorge, the point at which the South Esk River carves its way through solid rock and enters the Tamar River Valley. Cataract Gorge is a true wilderness area, and it is in the heart of Tasmania’s second largest city. The walk will take about 2 or 3 hours at a leisurely pace, depending on how long you linger at various features. The Gorge Restaurant in the Cliff Grounds Reserve offers an excellent lunch venue, and lighter meals are available from the Basin Cafe at the First Basin. 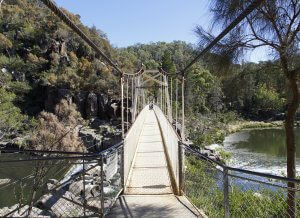 The first recorded mention of Cataract Gorge is in 1804. The King’s Bridge – Cataract Walk pathway runs from the entrance of the Gorge and takes you beside the river deep into the gorge to the first Basin and beyond. The walkway was built by volunteers in the 1890’s and has long been one of Launceston’s major attractions. It is unusual to find such a wilderness area so close to a city. The chairlift that crosses the Gorge at the First Basin was built in 1972 and is listed as having the longest single span chairlift in the world. In summer, Cataract Gorge is a tranquil retreat, and in winter it can flood in a most spectacular fashion after heavy rains. The walk starts in King’s Park, the water frontage between the Tamar River and the Penny Royal Watermill complex on Bridge Road. With the water on your right, walk along the foreshore path, under the West Tamar Highway Road Bridge, and climb up to Bridge Road. Turn right and walk across the steel structure bridge, Kings Bridge. For nearly 100 years this was the only bridge allowing access to the West Bank of the Tamar River from Launceston. Immediately over the bridge, the path runs left and along the Gorge. The water of the South Esk River will be on your left. Follow the path as it winds its way into the Gorge. Watch for the path turnoff to the right that takes you uphill to a lookout for scenic views up the Gorge if so inclined. Continue along the path to the First Basin. This open area has some excellent gardens, the Gorge Restaurant and easy walking paths. The Interpretation Centre built into the decommissioned Duck Reach Power Station is well worth a visit, and the Restaurants, cafes and facilities of the Basin are worth looking around. There are a number of well marked paths that will take you further into the Reserve on isolated bush trails, and these make for excellent walking. After walking these trails return to the First Basin. After spending time in the First Basin, ride the Chairlift if so inclined. It is said to be the longest single span chairlift in the Southern Hemisphere. Cross the South Esk by way of the Suspension Bridge (circa. 1940) at the western end of the First basin. You will see the Car Park up and on your right as you head downstream from the first Basin. 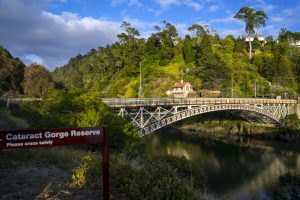 Enter the Zig Zag Reserve and walk back to the mouth of the Gorge and Launceston City by way of the Zig Zag Track along the south side of the Gorge. The Zig Zag track will bring you back to King’s Bridge. and the Penny Royal Motel complex. What an amazing experience and nature walk right in Launceston. Make sure you pack a picnic lunch!